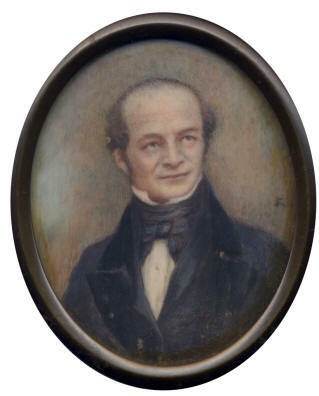 Louis Schwabe was born on 4 August 1798 in Dessau, Germany, the son of Samson Benjamin Schwabe. 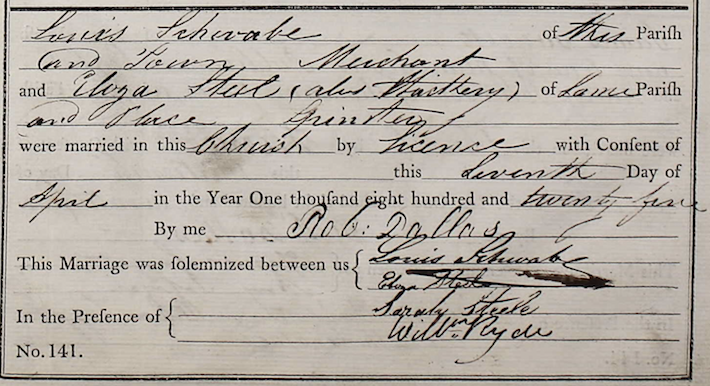 He married Eliza Steel on 7 April 1825 at Manchester. ELIZA born on 6 May 1833. As for Louis’ wife, Eliza Steel, the family claims that she was a Thackeray of the novelist’s family and the marriage allegation followed by the license below both refer in some way to that name. However it is unclear how exactly Eliza is connected to William Makepeace, if at all. The eldest child, John Thackeray, died aged 6 years of ‘intermittent fever’ according to the Rusholme Road cemetery’s burial records at Chorlton Upon Medlock. What is of interest is the name of the officiating minister – William Gaskell – the husband of the novelist Elizabeth Gaskell. Louis’ will is available and can be read HERE (<— in PDF). Below the entry for Louis and his wife at Rusholme Road Cemetery, Manchester. The family appeared on the 1841 census below consisting of Louis, his wife Eliza and three children – Rosalie, Louis and Eliza. Louis emigrated to Manchester, England, where he established a successful silk factory which among other things produced Queen Victoria’s wedding dress (see below). He also invented a number of methods for spinning silk and creating artificial fibres. However, Louis committed suicide by drinking sulphuric acid in January 1845. Following his death various notices appeared in the papers some of which are reproduced below. Lately: Aged 47, Mr. Louis Schwabe, one of the Council of the Royal Manchester Institution. Mr. Schwabe was a manufacturer of silks of a high class, and might be said to have been the father of that branch of manufacture in Manchester having had on his books at the time of his decease orders not only for the high of our land, but for those of the French also, the name of the illustrious Louis Philippe appearing as one of his patrons. Mr. Schwabe was one of the many instances of those who rise in the world by dint of probity, talent, and industry. A native of Dessau in Germany where he was born in 1798, he came a stranger to Manchester in the year 1817, and, after working his way through the elementary processes of the silk manufacture (then taking root in the that town) he proceeded in his career until he attained the head of that important branch of manufacture the palaces of Windsor and Buckingham having been, in more instances than one, supplied from his looms. We regret to announce the death of Mr. Louis Schwabe, of this town, the eminent silk-manufacturer and embroiderer by machinery, under circumstances of a peculiarly distressing character. On Friday forenoon last he returned home from the mill in a cab, and stated that he was very ill. He was promptly attended by Mr. Ransome, surgeon, who being in the immediate neighborhood, was instantly on the spot, and who sent for Mr. Turner and Dr. Lyon. They saw from the symptoms that Mr. Schwabe was suffering under the influence of some powerful poison. Notwithstanding all the aid that medical science and skill could give, however, the unfortunate gentleman lingered in great suffering only till half-past seven on Saturday morning, when he expired. An inquest was held at his residence, Plymouth Grove, on Monday last, before Mr. Chapman, borough coroner, a respectable jury, when it appeared, that having obtained from a dyer at his works some sulphuric acid, for the purpose, as he said, of making some experiment with it (which he had frequently done before), he had taken a quantity of this corrosive poison. We understand that on Wednesday last, intelligence reached Mr. Schwabe of the death of his father, at Dessau, in Germany, and this circumstance evidently produced very considerable effect upon him, and probably led to the distressing event. Under these circumstances, after hearing the evidence, the jury returned an unanimous verdict to the effect that the fatal act was committed while the deceased was labouring under temporary insanity. 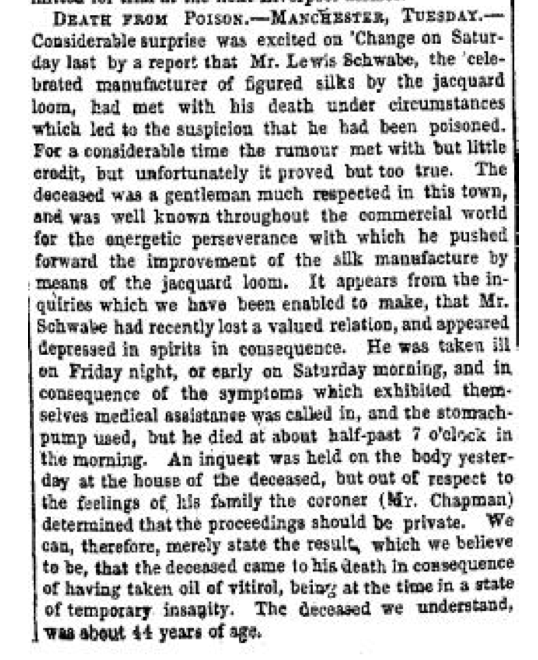 Considerable surprise was excited on ‘change on Saturday last by a report that Mr. Louis Schwabe, the celebrated manufacturer of figured silk by the jacquard loom, had met with his death under circumstances which led to the suspicion that he had been poisoned. For a considerable time the rumour met with but little credit. But unfortunately it proved but too true. The deceased was a gentleman much respected in this town, and was well known throughout the commercial world for the energetic perseverance with which he pushed forward the improvement of the silk manufacture by means of the jacquard loom. It appears from inquiries which we have been enabled to make, that Mr. Schwabe had recently lost a valued relation, and appeared depressed in spirits in consequence. He was taken ill on Friday night, or early on Saturday morning, and in consequence of the symptoms which exhibited themselves medical assistance was called in and the stomach pump was used, but he died at about half past 7 0’ Clock in the morning. An inquest was held on the body yesterday at the house of the deceased, but out of respect of to the feelings of his family the coroner (Mr. Chapman) determined that the proceedings should be private. We can, therefore, merely state the result, which we believe to be, that the deceased cam to his death in consequence of having taken oil of vitriol, being at the time in a state of temporary insanity. The deceased, we understand, was about 41 years of age. In Clift v. Schwabe (1846, 3 C. B. 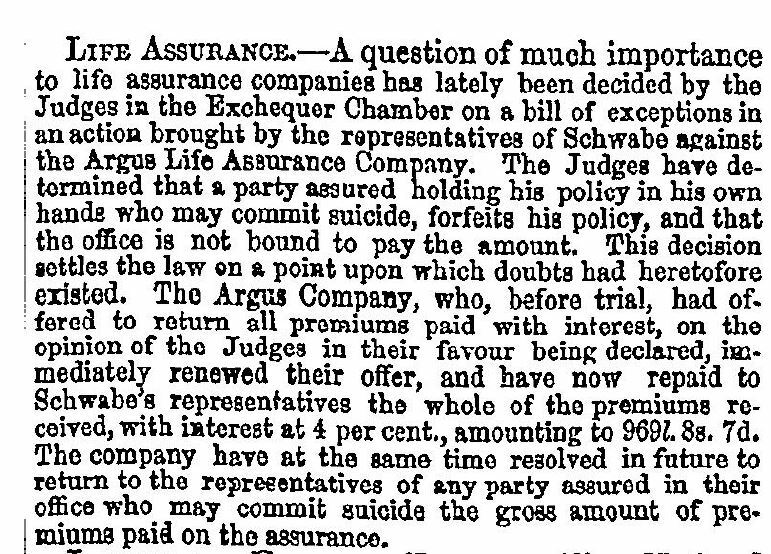 437) the facts were as follows :- Louis Schwabe effected a policy with the Argus Assurance Co. on his own life, subject inter alia to a condition that “every policy effected by a person on his or her own life should be void if such person should commit suicide or die by duelling or the hand of justice.” Schwabe died in consequence of having voluntarily—i.e. for the purpose of killing himself—taken sulphuric acid, but under circumstances tending to show that he was at the time of unsound mind. In an action by his administratrix (Eliza) upon the policy, the defendants (the Argus Assurance Co.) pleaded that Schwabe did commit suicide whereby the policy became void; and at the trial Mr. Justice Cresswell directed the jury “that in order to find the issue for the defendants it was necessary that they should be satisfied that Louis Schwabe died by his own voluntary act, being then able to distinguish between right and wrong, and to appreciate the nature and quality of the act he was doing, so as to be a responsible moral agent, that the burthen of proof as to his dying by his own voluntary act was on the defendants but, that being established, the jury must assume that he was of sane mind, and a responsible moral agent unless the contra should appear in evidence.” Upon a bill of exceptions it was held by the Court of Common Pleas ——not, however, without the dissent of two strong judges —-Pollock, C.B., and Wightman, J .—that that part of the direction which we have placed in italics was erroneous, that the terms of the condition included all voluntary acts of self-destruction, and therefore that if Schwabe voluntarily killed himself, it was immaterial whether he was or was not at the time a responsible moral agent. In Clift v. Schwabe the words “commit suicide” were held to be equivalent to the words “die by his own hand.” Details of the case can be read here. Louis Schwabe’s contribution to the manufacture of silk and the beginning of the invention of artificial textiles can be seen from the following summaries. His grant of a patent can be read HERE. Another description of his work from An Illustrated Itinerary of the County of Lancashire can be read here. No one who has visited the establishment of Mr. Lewis [sic] Schwabe, of Manchester, can ever forget the extraordinary beauty of the fabrics wrought in his Jacquard looms. The richness and beauty of the patterns surpass all that the imagination could previously have conceived : the flowers wrought into the silks and satins appear more like the work of the best painter than of the weaver. He has also some of the finest specimens yet produced, 0f the interweaving of glass thread with textile fabrics. But nothing in this establishment is more likely to en— gage the attention of a scientific visitor, than the application of the pantagraph to the art of embroidery. The embroidery loom is an upright frame, on the top of which is a moveable rod attached to one arm of the pantagraph. The material to be embroidered passes over this rod to a roller beneath. On each side are carriages having a horizontal motion backwards and forwards, supplied with a system of clippers, and also of needles having the eye in the middle; these needles are threaded with the various coloured silks that are to be embroidered on the suspended piece. The tenter, sitting at one end, moves the long arm of the pantagraph to a point marked in a copy of the pattern, and the other arm of the pantagraph gives a corresponding motion to the rod from which the piece is suspended; one of the carriages moving forward drives its needles into the suspended cloth; they are then caught and drawn through by the clippers in the carriage at the other side; this process is repeated at every change of the pantagraph, and thus several copies are embroidered with mathematical accuracy on the piece at the same time. So simple is this very ingenious contrivance, that the frame may be worked by a woman and two girls; the woman guiding the pantagraph to the points marked on the pattern, and the girls directing the motion of the carriages. Mr. Schwabe has several Jacquard looms at work, and in these are produced some varieties of figured satin, such as we have not seen in any other establishment. Among these, a pattern differing from the ground-work only by a shade of tint is particularly remarkable; the effect produced is that of the finest pencilling, and both in beauty of design and accuracy of execution not unworthy of the first artist. 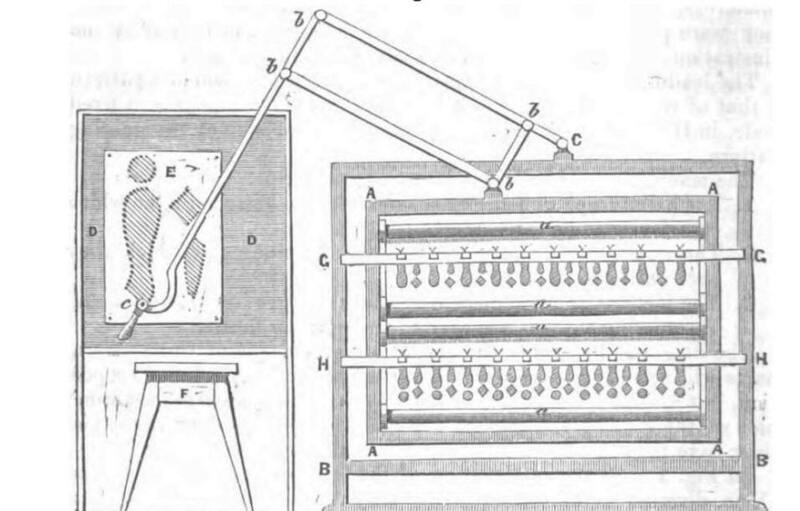 The report of the British Association states that Mr. Schwabe explained to the members his method of spinning glass and showed specimens of the glass thread and cloth woven from it; he also showed the spinning machine which he had employed for the purpose. He pointed out that he was not satisfied with the substance he was using to spin filaments from and therefore asked the Association to assist him in ” carrying out experiments which would lead to the discovery of a substance which would form a homogeneous mass possessing the quality of ductility and susceptible of being drawn out through fine holes, or otherwise, into filaments or fibres possessing suitable strength and other properties to adapt it for manufacturing purposes.” * When we remember Mr. Schwabe was “an eminent silk manufacturer” with his own dye works it is reasonable to assume that he had in mind the production of filaments similar to silk. Unfortunately, although the Association assisted several persons to pursue their studies they did not help Mr. Schwabe. The only conclusion one can draw from the way they ignored his request is that he was before the times with his idea, or in other words, they did not understand what he was talking about. What a pity. Nor did the Press take any heed of his machine or his appeal. 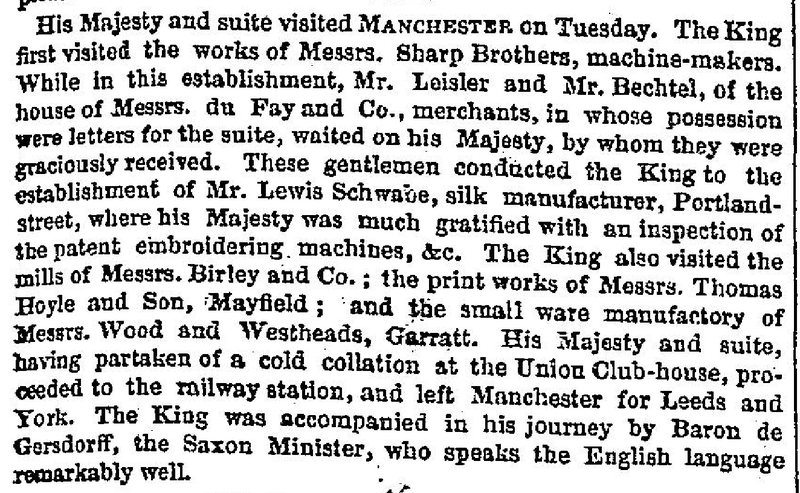 In the ” Manchester Courier” report his address is dismissed in one line, but although he was treated with such indifference he thanked the Association on behalf of the Manufacturers of Lancashire for their visit. One very important point in his statement is that in which he speaks of drawing his mixing through fine holes in order to produce filaments. Thus he anticipated the use of spinnerets, and for this alone he deserves particular mention in any story of the rayon industry. Judging by the experience of other inventors of his day he might have done much better if he had made his appeal on the Continent. As it was his life ended in tragedy. On the afternoon of January 11 1856, he obtained some sulphuric acid from one of his workmen and took it home, explaining that he wanted it for experimental purposes. Within an hour he died of sulphuric acid poisoning. He was dispirited over his apparent failure, but there was another cause which made him very depressed at the time* he had just received word of the death at Dessau, Germany, of his father, to whom he was very much attached. He thought he had failed. In reality he had succeeded. He was the first man to use spinnerets such as those by which all rayon is now produced. * “Manchester Courier,” June, 1842. * 1842 report, British Association. Forecast of Process in 1812. It is generally assumed that artificial silk was first put before the public at the International Expedition held in Paris in 1889. Following the introduction of nitro-silk and copper-ammonia silk came the viscose process and more recently the invention of acetate silk. The viscose process stands to the credit of British scientists and it has laid the foundation of a great industry. For the germ idea of artificial silk it is necessary, however, to go back to the first of the 19th century. The first suggestion for a fabric of this character appears to have been made in a paper contributed by Mr. Louis Schwabe to the Manchester meeting of the British Association in 1842. Mr. Schwabe, who was at the time in business as a silk manufacturer and had mills in Portland Street Manchester, was well known in the trade, and it is stated that silk fabrics were woven at his mills for Queen Victoria and for the French Court. He was an inventor as well as a manufacturer, and at the meeting of the British Association referred to exhibited some of his productions at the Royal Institution, Manchester which is now the Art Gallery. One of his inventions was a machine for the spinning glass by power into a fine fibre. In the paper read at the Manchester meeting he asked for the assistance of the British Association for the carrying out of experiments which would “lead to the discovery of a substance which would form a homogeneous mass, possessing the quality of ductility, and susceptible of being drawn out through fine holes or otherwise into filaments or fibres possessing suitable strength and other properties to adapt it for manufacturing purposes.” In another part of the paper comment was made on the important commercial results which must follow the working out of a process of this character, applied it may be assumed, to the production of imitations of the silk fabrics in the manufacture of which Mr. Schwabe was then engaged. The modern process of artificial silk manufacture – taking the viscose process as an example involves the conversion of the viscose solutions into a condition into which they can be formed into a thread by spinning through fine holes into the spinning bath. The ideas presented to the British Association in 1842 forecast a process of this character. FROM: The Hand-Book of Manchester. One of the most interesting of these mills, in Manchester, is that belonging to Mr. Louis Schwabe, situate in Portland-street. Mr. S. spins or throws, and dyes His own silk, and manufactures nearly all descriptions of silk damasks and brocades. The silks for the decoration of the most magnificent apartments in the mansions of the nobility, and also of the royal palaces, are furnished from this concern; some of these splendid silks sell as high as seven guineas per yard. To produce this work, which is held in so much estimation, the Jacquard machine is principally employed, and also the machines for embroidering; the latter are only in use at this establishment, as Mr. S. now holds the patent for this invention. Under the superintendence of Mr. S. the productions of this beautiful machinery have been brought to such perfection, that any quantity of the most complicated embroidery, comprising an infinite variety of brilliant colouring, can be produced, and, when compared with the years of constant and fatiguing exertion consumed in producing work of a similar description in former times, in a very short space of time. Silk.The silk trade of Manchester and of Macclesfield, which for that purpose is a suburb of Manchester, arose in the restrictions imposed upon Spitalfields, at the request of the weavers, by successive acts of Parliament, for the purpose of regulating employment in that district. In 1830 there were not 100 Jacquard Looms in Manchester and its neighbourhood, whilst at the present time there are probably 12,000 employed either on silk or some branch of figure weaving. The most convenient silk manufactory for the visit of the stranger is that of Messrs. James Houldsworth of Portland Street, near the Royal Infirmary. This firm was established by a German gentleman, the late Mr. Louis Schwabe, an intelligent German, who introduced the higher class of silk manufacture with such success as to enable him to compete with even the very first class of Lyons silks for furniture damasks. In addition to the extensive application of the Jacquard loom, Mr. Schwabe introduced, and Mr. Henry Houldsworth improved and perfected, the embroidering machines invented by Mr. Heilmann of Mulhausen. The improvements are so great that the original inventor cannot compete with them. Hows of needles elaborate the most tasteful designs with a degree of accuracy to which hand labour cannot approach. In 1829 Henry Houldsworth, a Manchester silk spinner, purchased his first industrial embroidery machine, together with British patent rights, from Mulhouse in France, where it had been invented a year earlier. By 1834 improvements had been achieved by Houldsworth and Louis Schwabe, a fellow manufacturer. Houldsworth exhibited his work at the Manchester Exhibition of 1848, the Great Exhibition of 1851 and the Dublin Exhibition of 1853. In 1880 the firm was taken over by Todd & Co.
Embroidering Machines – Although embroidery has, until within a few years, been a purely handicraft employment, chiefly cultivated by females as a tasteful and elegant occupation or amusement, it has also assumed the character of a manufacture, a most ingenious machine for executing it having been invented by M. Heilmann, of Mullhausen. This admirable contrivance, which enables a female to embroider any design with 80 or 140 needles as accurately and expeditiously as she formerly could with one, requires the labour of one grown person to superintend the work, and of two children to change the needles when their threads are used, and to watch continually for any irregularities of action which may need attention. The chief parts of the machine may briefly be described as follows: [at this point there is a fairly lengthy description of the machine which I have placed along with an illustration of it below because this document is intended to focus more on Schwabe]. This very ingenious machine was sold by M. Heilmann to Messrs. Kochlin, of Muhlhausen, who patented it in England. 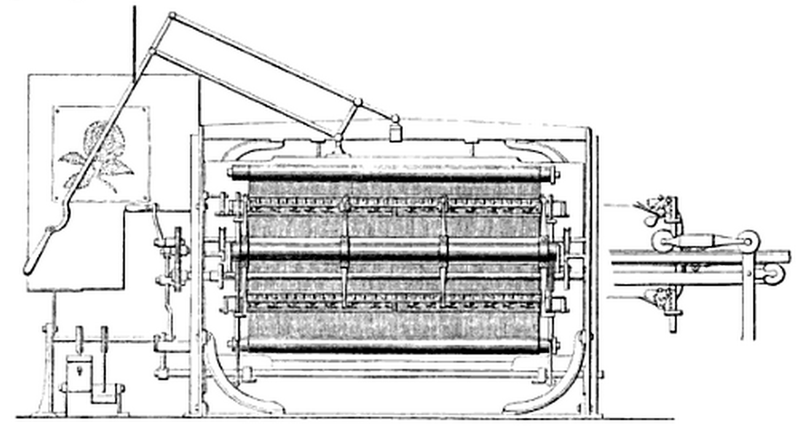 The first successful use of the machines (as improved my Houldsworth and Schwabe) was in the silk manufactory of the late Mr. Louis Schwabe, in the then Portland-street Mill, Manchester; Mr. Houldsworth having made an arrangement with Mr. Schwabe, as a manufacturer in whose trade their powers would find most development. Here they were employed in embroideries for upholsterery, but briefly in the “sprigging” of waistcoatings, to which they were peculiarly adapted..
On Schwabe’s death in 1845 Houldsworth took over his business. From this time it was known as James Houldsworth & Co. and became the leading manufacturer of machine embroidery in Britain. Here follows the more detailed description of how the machine worked that was removed from the beginning of this passage. The needles, which are pointed at both ends, and have their eyes in the middle, so that they need not be turned round between each time of passing through the web, are passed backwards and forwards by the action of small pincers, of which there are two pair to each needle, one on each side of the web, each pair being alternately employed in pushing and pulling the needle through the web. As soon as the needles have passed completely through in either direction, a kind of carriage or framing, which carries the series of pincers by which they have been drawn through, begins to move along a railway so as to draw the needles to the full length of their threads; after which the carriage returns to its original position, and its pincers put the needles again through the web, to be received on the opposite side by the other set of pincers, which then retire with them in like manner. So far as the action of this part of the machine c:m affect the matter, the needles would continually pass through the same holes in the web; but to enable them to pass through it at different points in succession, according to the pattern required, the web itself, which is placed vertically in a frame furnished with rollers on which it can be wrapped as on the roller of a loom, is caused to assume a different position after each passage of the needles. This is done by connecting the frame with a kind of pantograph, the point or tracer of which can be moved at pleasure over every portion of a drawing or pattern, which represents, on a greatly enlarged scale, the flower or device to be embroidered. The operator brings the point of the pantograph successively to every point of the pattern device at which it is desired to plant a stitch; and by this means so moves the web-frame that the corresponding point of every flower, or place where a flower is to be worked, upon it, is brought opposite to the point of one of the needles. The mechanism by which the pincers are worked is then brought into action by means of handles and pedals, by which every needle of the series is put through the web, and drawn until its thread is brought home; after which the needles return to their original position, while by the working of the pantograph another point, or rather series of points, of the web is brought opposite to them ready for the return stitch. By such means every needle of the series produces a distinct and separate copy, on a small scale, of the pattern, the arrangement of the stitches being precisely according to the movements of the pantograph. In its present and most improved form, the machine consists essentially of four parts – an embroidering frame, on which the cloth to be embroidered is stretched; a pantograph attached to the frame; a series of needles and pincers; and mechanism for passing and re-passing the thread through the fabric. The cloth is stretched vertically. The design is sketched on stout paper or on tin-plate, usually six times the size of the work to be done. The pantograph conveys the design, as it were, from the drawing to the cloth. The length of all the stitches is arranged to a definite scale; a hole is punched in the paper at each end of every stitch; the pointer of the pantograph is moved backwards and forwards over the system of holes, thrusting into each hole in turn; and with each movement the needles are drawn backwards and forwards though the cloth. The action of the needles, although improved like everything else belonging to the machine, maybe understood from the description given in the last paragraph. Some of the machines are large enough to employ six persons; some are small enough to be worked by one. Very little hand-work is necessary in finishing embroidery worked by these machines. There are certain limits, beyond which, machine-embroidery is not so useful as that effected by hand; but it has this merit, that the embroidering is equally good on both sides of the cloth. Mr. Houldsworth has invented a mode of embroidering in curves; he stretches the fabric on elastic cross-pieces; screws it up so as to draw the threads into a curved line; embroiders in a straight line; loosens the screws; and allows the cloth to resume its original position – the rows of embroidery stitches then appear in curved lines instead of straight. In producing a chintz-like effect, many colours are used in many needles. Another mode of producing variegated effects is to dye the silk thread differently at different parts of its length. It is not absolutely incontrovertible that Louis Schwabe manufactured Queen Victoria’s wedding dress. Certainly tradition has it so and what follows are summaries from various sources that support the tradition. Also some details of the machinery Schwabe used to manufacture his silk pieces. 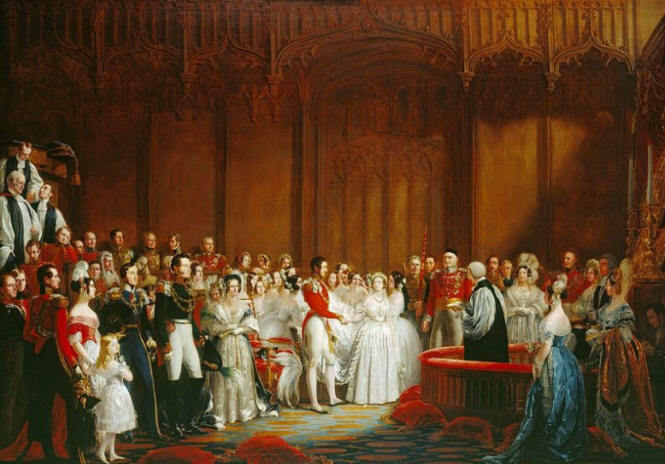 Of absorbing interest to the ladies were the marriage dress and train of Her Majesty the Queen, manufactured, and the train embroidered, at Mr. Louis Schwabe’s old mill, in Portland Street, in 1839, a white satin, embroidered in colours. The design was said to be Her Majesty’s own, and the late Mr. Henry Houldsworth, of Manchester (then with Mr. Schwabe), had some patent machinery constructed for the execution of the embroidery. A curious piece of stuff in one of the cases was a damask, woven as an experiment by Mr. Schwabe, in which the warp was of silk and the weft of spun glass. It looked very well, but apparently did not commend itself to the weavers. The Queen’s dress and train, manufactured at the old mill in Portland Street, by Mr. Louis Schwabe shortly before Her Majesty’s marriage, and understood at the time to be Her Majesty’s “wedding” dress. 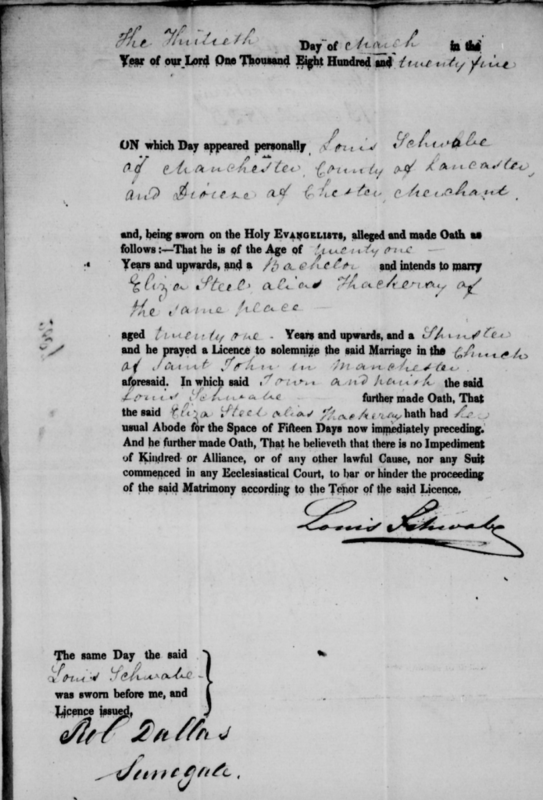 The following is an extract-from a letter written by Mr. Louis Schwabe to the British Association on June 22nd, 1843, on the occasion of their meeting in Manchester. The embroidery was done by patent machinery constructed under the direction of the late Mr. Henry Houldsworth, of Manchester, who was at the time associated with Mr. Schwabe in business. The design is reported to be her Majesty’s own work.